As the FY 2016 budget process moves forward, there could be good news for our efforts to end homelessness, and in particular, ending chronic homelessness. This is because there is still the opportunity for Congress to fulfill the request made by President Obama in this Fiscal Year budget to provide $2.48 billion for HUD’s Homeless Assistance Grants, which includes $265 million to create 25,500 additional permanent supportive housing units to achieve the goal of ending chronic homelessness in 2017. Ending chronic homelessness is evidence-based policymaking – If there is one thing that policymakers agree on, it is that government must fund programs that work. Policies and programs must be backed by evidence and must be shown to be cost-effective. We owe that to the end-users of these programs, as well as to taxpayers. This is clearly the case with permanent supportive housing, where study after study has shown that the intervention helps people with even the most severe challenges achieve housing stability, reduces use of crisis services, and results in lower costs to the public. In fact, both OMB Director Shaun Donovan and newly elected Speaker of the House Paul Ryan have cited permanent supportive housing as good examples of evidence-based Federal policymaking. Ending chronic homelessness will help bend the health care cost curve – There is broad agreement that health care spending is something that we need to get a handle on, and that one of the ways to do this is to prevent hospitalizations and emergency department visits among the small subset of people with complex care needs and chronic health conditions—sometimes known at ‘super-utilizers’—who are responsible for a big portion of public health care costs. It has also been documented that individuals experiencing chronic homelessness are well-represented among health care super-utilizers. For example, one analysis in Connecticut identified about 400 individuals experiencing chronic homelessness that cost roughly $28 million a year in Medicaid costs. 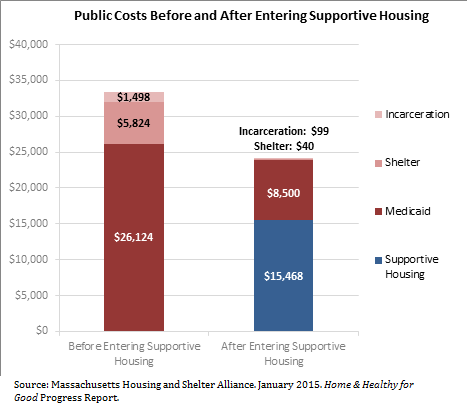 At the same time, the evidence is overwhelming that permanent supportive housing can dramatically reduce those costs, cutting them by as much as one-quarter or a third. It is this evidence that’s led the National Governors Association to include a focus on supportive housing as part of their Complex Care Programs Policy Academy, focused on improving care and reducing costs among Medicaid super-utilizers. If policymakers want to bend the health care cost curve, ending chronic homelessness is one good way to help achieve that. Ending chronic homelessness is part of the solution to mass incarceration – Another area where there is incredible bipartisan support is on criminal justice reform. There is growing consensus that mass incarceration has not made our cities and streets safer and has come at grave costs both to communities as well as to budgets. Corrections spending is among the highest budget items for states second only to Medicaid. There is a significant overlap between people experiencing chronic homelessness and people involved in the criminal justice system. Roughly 48,000 people who enter shelters every year report prison or jail as their prior residence and about 15 percent of people in jails (about 340,000 people every year) report having experienced homelessness. Jails have become the warehouses for persons with serious mental illness and people with substance use disorders. Many of these individuals—particularly those experiencing chronic homelessness—are caught in a revolving door of homelessness and incarceration. Here again, permanent supportive housing has been shown to be an effective solution for people caught in this cycle. Studies have found that supportive housing reduces the rate of arrests, the number of jail bookings, and the number of days spent in jail. This has led some states like Connecticut to include permanent supportive housing as part of their comprehensive criminal justice reform initiatives. The Federal government is also looking to test whether Pay for Success financing approaches can be used to replicate permanent supportive housing to break the cycle of homelessness and incarceration. Ending chronic homelessness is one of the rare instances of a policy issue where we know what must be done to solve it, and moreover, where the most compassionate thing to do is also the most fiscally responsible thing to do. It’s time now to align our budgets with what both our hearts and our heads tell us to do. It’s time to end chronic homelessness. Richard Cho is the Deputy Director at USICH, where he coordinates USICH's Federal policy efforts and the implementation of Opening Doors.